This week’s craft is super quick and easy and requires minimal materials! 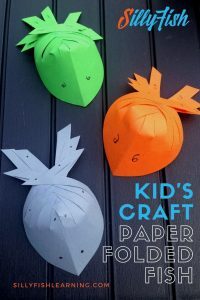 Paper folded fish is a five-minute craft for all ages. You will need scissors, coloured paper, glue and a pen to decorate. Fold the paper in half down the length. If you would like smaller fish, cut smaller rectangles first. Trim one end so it is curved and the other so it is pointed, with the longest edge along the fold. Cut lines up from the pointed edge. Be sure to cut equal strips on either side and along the fold. Cut more than half way up. Add an eye to either side of the fold, near the curved edge. You can add any additional decoration at this point too. Begin folding and sticking the tail strips across each other. How low you glue the strips determins the shape of the tail. Be sure to check how the tips are lining up before you stick to create the desired effect. Do you need materials? Why not use these? *These recommendations are affiliate links and help support us to keep the website free! Kid’s Craft – Silly Fish Weave with Printable Template!